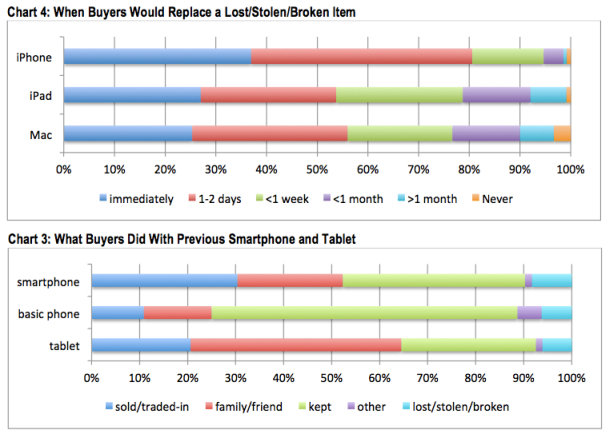 The CIRP report, which surveyed 2,000 U.S. customers who purchased an iPhone, iPad or Mac in 2013, shows that almost half of iPad owners will go without their tablet, waiting a week or more to replace a broken, lost or stolen device. They also are twice as likely as iPhone owners to give their older iPad to friends or family members. "We think Apple would prefer the iPad become a big iPhone," the report concludes. "We suspect, though, based on recent CIRP data about how buyers use them, that it's as much like a Mac, TV, or iPod, with less frequent replacement." This replacement rate could affect future sales, driving them down as the tablet market becomes saturated. In this scenario, consumers would hold onto an iPad for a longer period of time, and future first-time iPad owners would be more likely to receive an older iPad than buy a new one. Even as competition increases and the tablet market slows, Apple still is the top tablet vendor worldwide with 36 percent market share, according to Gartner's March 2014 report. The Cupertino company sold a record 26 million iPads in Q1 2014 and 195 million tablets overall. of course it does an iPad starts at 399 and iPhone starts at 99 or even less sometimes. Exactly. "In other news, people replace more expensive computing devices less often." Apple made my iPad 3 so well, I won't need to replace it for quite a while. My 2008 iMac and iPad 1 are doing just fine. Is it ok that I don't want to buy a new tablet every release cycle? I replace my phone every 2 years. I have an iPad 2 that I have no desire to replace. It does it's job just fine. Thats with a contract. The 5s starts at 650 without a contract, also most people dont have contracts with ipads where they are able to upgrade. Ipads also dont go through the wear and tear that phones do, being put in pockets and basically brought with the user everywhere. Id say the price has nothing to do with it, but due to the circumstances of how each device is put out there, tablets and computers are able to have that longer life cycle. I typically use my devices until they no longer work or do the job i need them to do. the iPad is a fairly expensive tablet. And the everyday, Average user isn't going to know the difference between 1 product lifecycle update. Case Study (Your mileage may vary). I purchased my sister an iPad2 for her birthday when the iPad 2 was fairly new. With 2 young kids, She loves it. It fully replaced using a computer for her at home as she could use it while keeping active with her children. She swears by it (she's a stay at home mom, but not by choice) as it still allows her full social interaction with friends and colleagues. She's not a gamer, And most of the time the iPad is in the 5 and 2 year olds hands (they can use it better than Grandma!). She is not a power user. She is a very typical baseline average for what can be done by the general population on these things. Forwards a few years. I bought my father an ipad4 for his use. as an expiriment, I switched them. Same software between the two and let my sister and the kids play with the 4. After which, I asked all their opinions on the difference. The kids obviously had no clue. they could launch everything exactly the same as before. easy peasy. Simple. the iPad was an iPad was an iPad. My sister didnt notice any significant differences. "slighty faster" and "a little lighter" was her explaination. in fact, She said she actually didnt notice until she went to plug it in and the connector was different. Similarly, I did this with my father as well. He saw absolutely zero difference either for his basic average everyday needs. when asked if they believed the value of $100 (more in Canada) was worth the upgrade from the 2 to the 4 for their use, they both claimed that there was absolutely no point in upgrading. What this case study shows to me is that the fundamental differences between versions of the iPad, even with Retina display, are not significantly different enough to convince existing "average baseline" users to spend another $499 to get the latest and greatest. That seems to be a trend reserved for well. US. the techno junkies who care about geekbench scores and counting the FPS in our games. Include in that the 3 was more of a stopgap product that really shouldn't have been made. its clear that there's not a big upgrade path. The iPad air on the otherhand introduces (IMHO) the first really true significant update to the iPad line since the iPad2's release. MacRumors have been awfully boring for the last few weeks. I would've expected plenty of leaks of the new MacBook Air, new iPhone 6, new Mac Mini et.c. by now. I find it strange that there is nothing to report. It seems maybe we won't be getting anything new until autumn. Maybe WWDC will only be focusing on software this year, which would be really boring as I've come to expect a new MBA. (The MBA has been updated at WWDC for the last two years). All this talk of new product releases throughout 2014... More than a quarter of the year has passed and not even ONE new product has been released. The new AppleTV has not yet been released. No new iPads. iPhones won't be arriving till September. No new computers (most computers show up as Do Not Buy in the Buyers Guide). No iWatch. Nothing. (No, I don't consider the 8GB 5c or the iPad 4 to be new products). What's going on? Is Apple going to release all products in Q3 & Q4? What are they supposed to do, make up leaks? If there's barely anything to report, it will get boring around here. iPhone doesn't "start at $99". $99 is a subsidized cost when you sign up for a brand new 2-year contract. The lowest cost off-contract iPhone 5C is $549.00, so iPhone is more expensive than iPad.